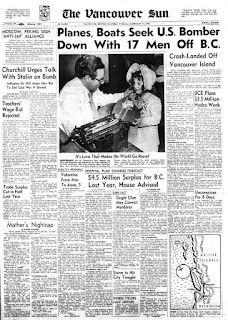 On February 13/14, 1950, during a mock nuclear bomb drop training exercise, two US Air Force planes departed from Alaska en route to Texas. 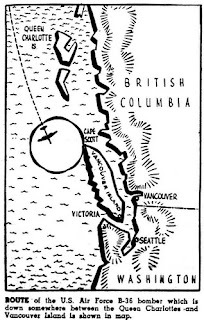 Their flight plan was to keep them out of Canadian air space until they would come toward land to conduct manoeuvres over California. It was bitterly cold in Alaska, and from take-off the planes began to suffer a number of malfunctions. 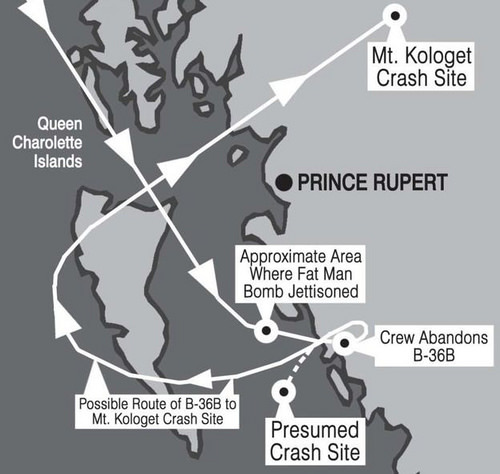 As the planes approached Haida Gwaii it became apparent that a B 36 Bomber, carrying a Mark IV atomic bomb, was going down. The plane had multiple engine failure. 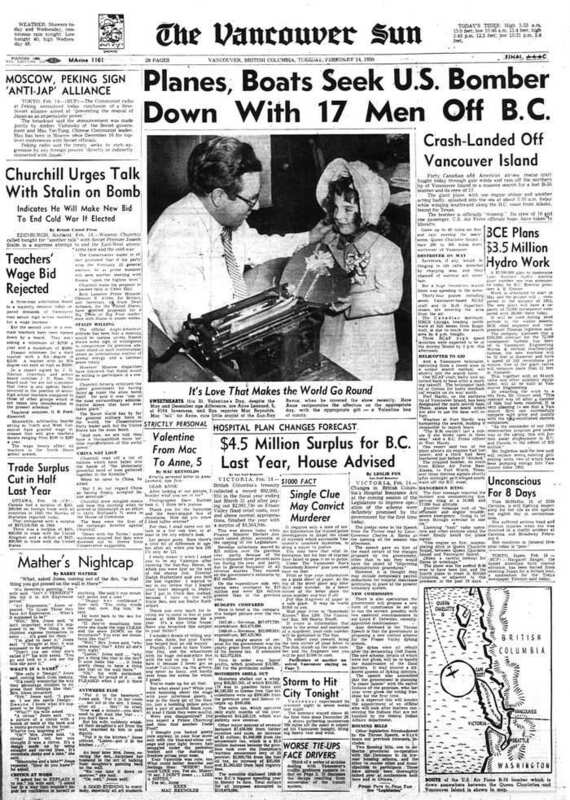 The US Air Force was under strict orders not to let their bomb technology fall into enemy (Russian) hands, and the crew jettisoned the bomb over the Pacific Ocean (reportedly without the fuse device that would ignite a nuclear explosion) before parachuting down over the Inside Passage. There were 17 crew members on board, and 12 were rescued after they were found on Princess Royal Island. 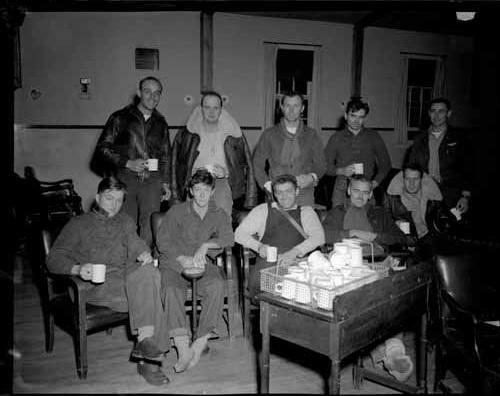 The crew were taken to Port Hardy, where the historical photo of the week shows them warming up after their ordeal. 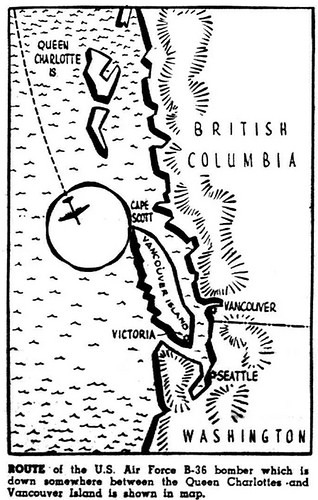 The plane, originally thought lost in the ocean, was eventually located near Smithers, BC. For more information about the crash check out the book Lost Nuke: The Last Flight of Bomber 075 by Dirk Septer. This historical photo of the week shows an Indigenous woman drying seaweed. She is not identified in the photo. This picture is credited to Clifford R. Kopas, believed to be taken while he was travelling on the CPR steamship Cassiar in the 1920s or 1930s in Smith Inlet. Local First Nations have harvested many resources from the ocean and land for thousands of years, often travelling around their territory seasonally to harvest various items at preferred traditional locations. 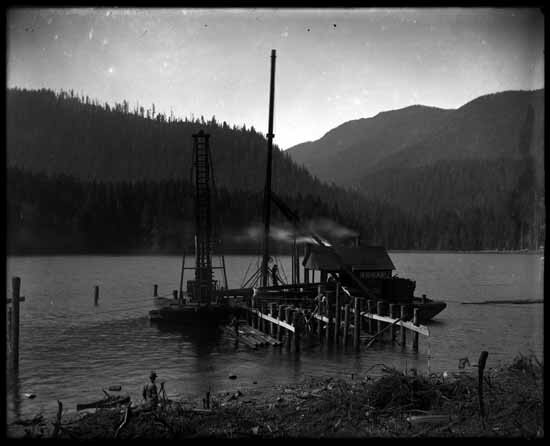 Over 100 years ago the Quatsino Power and Pulp Co. began development of a mill in Port Alice in order to process the vast timber resources in the Quatsino Sound area. The company changed hands a couple of times during the war years, but Whalen Pulp and Paper Mills did complete the construction of the mill and a townsite by 1918. 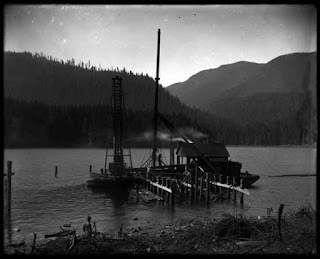 This historical photo of the week shows the construction of the original Port Alice dock, circa 1916. Photo by Ben Leeson.